Given that Google have extended Google Maps with a personalization tool called MyMaps, I thought I'd give it a try to see if I could plot the route of a walk we did recently up in Glen Lednock. 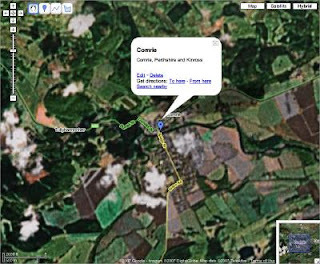 MyMaps allows you to create a new map, to which you can add placemarks, lines and shapes and to each of those you can add Rich Text or HTML descriptions, photos and videos. You can then share these maps with the rest of the world if you want to and you can even view your maps with Google Earth. Obviously, you'll need a Google account to be able to save and share your maps. Having added the first placemark, I thought I'd zoom in and start plotting the route and major placemarks and that's where the problems started. Basically the Google map data is woefully inadequate for this task, at least it is for the UK. The River Lednock wasn't shown on the standard Map view and when I switched over to Hybrid view I had to zoom out five times to the 2000'/inch setting and that just isn't good enough to resolve anything useful, as you can see from the image above. 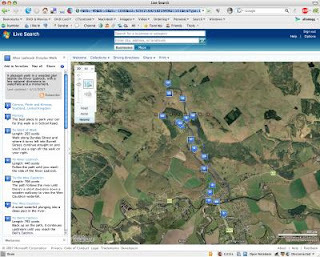 Undaunted, I moved over to Microsoft Virtual Earth (or Windows Live Search) to see if it could do anything similar and it looked like it could via what they call Collections. Of course, the next thing I did before proceeding any further was to check if the map data was any better and wow, it was really good. I could see individual trees beside the river! That was it was sold as far as I was concerned! You have to have a Windows Live account to save and share a Collection but that was no different from the Google offering so off I went and signed up. As you can see, its got place markers and lines following the route. There's also a list with each element on the left and all of them have notes and some even show images from my Flickr! account as well. The only regret I have is that I didn't set the line colour to be a more in contrast with the background and there doesn't seem to be any way to edit these settings once an element has been placed. To sum it up, both systems have some benefits depending on what you want to use them for. Google MyMaps has some better annotation features in that you can edit in Rich Text or HTML and you can add images and movies as well and then layer the lot onto Google Earth, which could be great for reliving those holiday experiences. However, Windows Live has much better UK data and you can set colours and line styles so, for me, it was the much better choice for route mapping. What about Yahoo! Local Maps? Unfortunately the UK data wasn't much better then Google's and there were no personalization features available. Google Checkout Hits the UK!